CRAZY LOW PRICE! 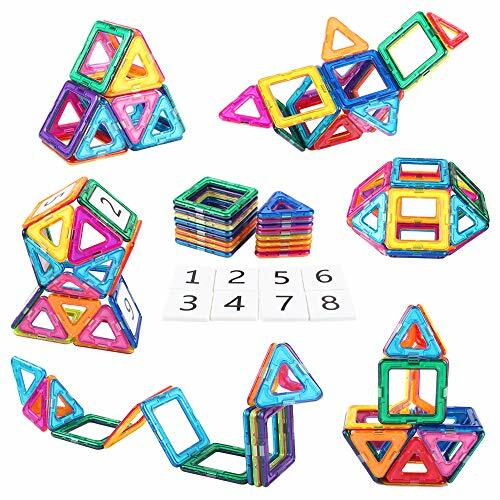 Magnetic Blocks Set & FREE Shipping! Get an extra 10% off with the Digital Coupon! 【Develop Multiple Skills】: Color and Shape Recognition, Creativity & Imagination, Motor Skills, Manipulative Ability, Thinking & Problem Solving Ability, Building & Design Ability are developed while playing. 【High quality & Safe】: Made of non-toxic and durable ABS plastic, food grade material; Round edge design without sharpness of each block, no worry about hurting your kid's little hands. 【Magnetic & More fun】: Magnets ensure pieces to attach to each other without falling apart unless pulled apart. 【Best choice for beginner】: Totally 24pcs: including 8*triangle, 20*quadrangle, 8* fixture block. 2 different random colors on each side of each magnetic tile. Basic magnetic tiles group with booklet for beginner. Can upgrade by buying more blocks. 【Compatible with other brands】: Compatible with other similar size magnetic tiles, Would be great add-on for those you already have.